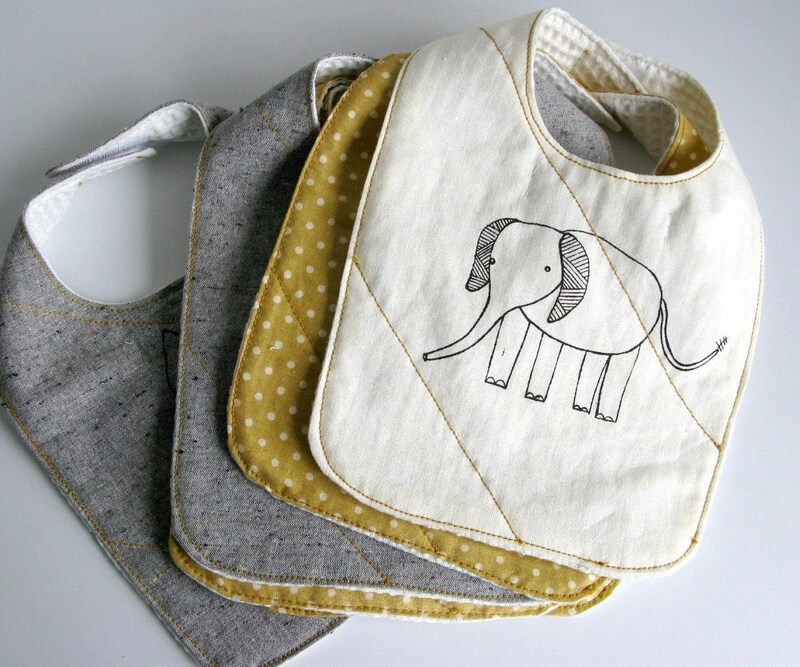 If you want to make adorable bibs for your little nosher here is a great tutorial I found at Sewingdork.blogspot.com. I mean look at ’em, what’s not to love?! Unfortunately, I’m a slacker when it comes to sewing what is destined to be blackberry, sunflower seed butter and tomato sauce besmirched. While I might let Eli eat in store- bought clothing when we are out of clean bibs, if he is wearing a mama-made item that day, at meal time he will suddenly find himself playing for the skins team. This has been happening fairly frequently as with only 3 people in our household, he runs out of bibs between loads of laundry being washed. Enter the t-shirt bonanza of 2010. A local t-shirt printing company advertised on Freecycle that they had a misprint order of 3 boxes of t-shirts to give away. I was just beginning to sew with knit material so I claimed one of the boxes. Oh my goodness, but I found myself awash in black t-shirts as the box contains I-don’t-know-how-many shirts… 50? 70? I don’t want to take them out of their tightly packed state just to count them and then not be able to store them again as neatly afterwards. All I know is that the box was quite heavy! Seriously, if you live locally (Orange County, CA) and would like to share in the bonanza please contact me. If I were to endeavor to use all this fabric Eli would be quickly labeled “Goth” even at the tender age of 2. Since I don’t use the front decal part of the shirt when harvesting fabric, using it for a bib makes perfect sense. from Sir Bubbadoo. Really hard to beat a woodland theme if your shooting for cuteness. from The Posh Pea Boutique. We like just about anything giraffe around here! From Down Home Amy. Love the quilting and the whimsical elephant! So if you also find yourself short on bibs, go forth and cut, sew or buy! Thank you. 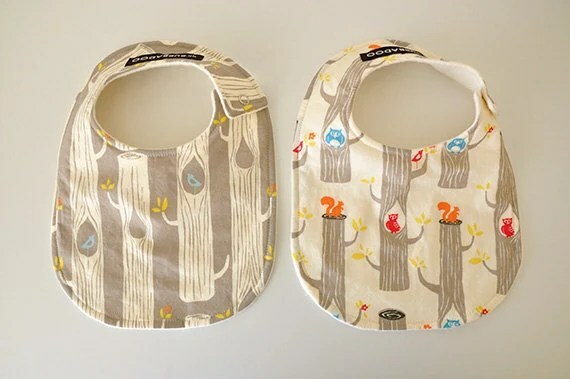 If you’re making for a new baby it is definitely worth your while to go with the cute bibs. They wear them all the time during the spit up phase. 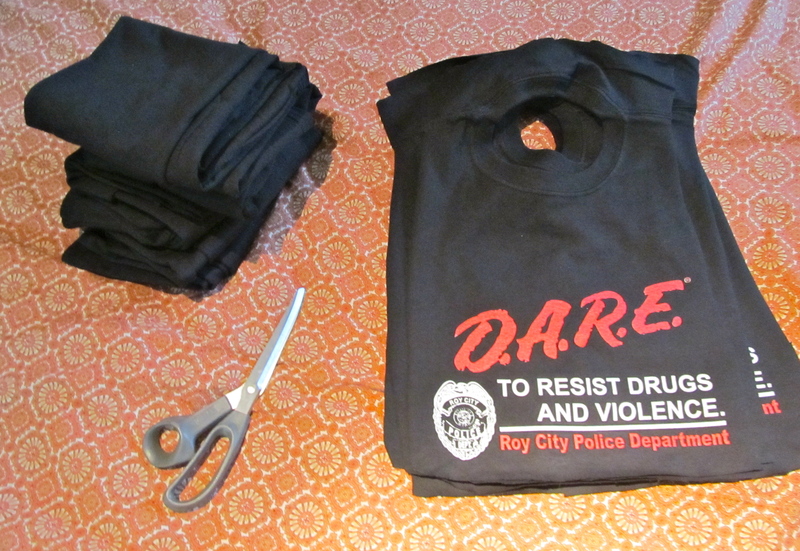 How depressing to start your life clad in reject black D.A.R.E. day in and day out! Thank you Sofia. I especially like that Eli isn’t annoyed by a velcro closure in back. He doesn’t mind wearing these bibs. That is a great way to upcycle someone’s mistake. I like the idea of using the shirts for bibs and protecting good clothing. I know more than a few tops were forever stained by spaghetti sauce. Thank you for linking up at the It’s a Wrap Link Party at Artful Rising. Thanks for stopping by! Spaghetti sauce can be hard to get out. We should be well protected from here on out! Such a smart idea! I love that you invested a whopping 45 seconds into each one. (I have a few t-shirt refashions on my tutorial page if you want some more ideas of what to do with your landslide). Thanks so much for sharing at Etcetorize this week! thanks for linking to my applique boy bib tutorial! 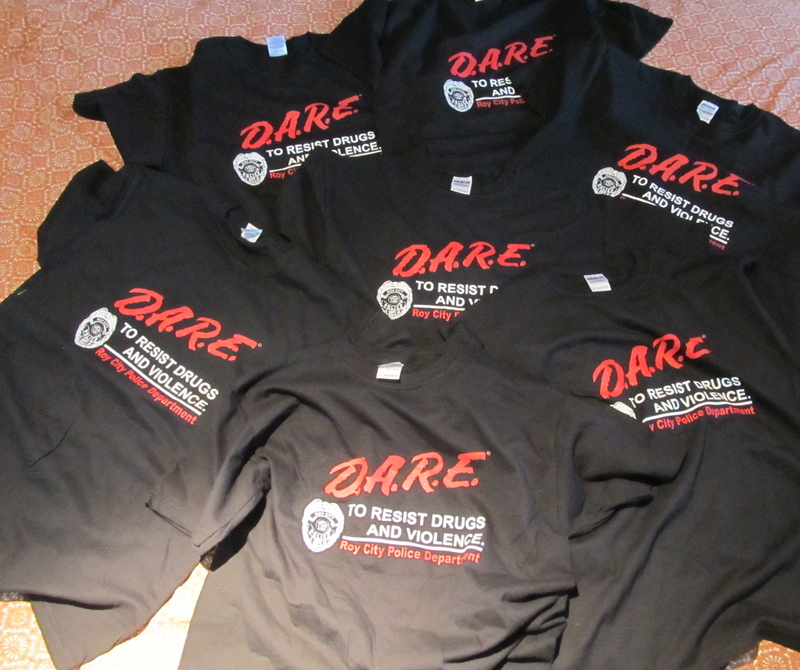 way to use up those DARE t-shirts. i definitely had one of those in my middle school days. I was happy to link… those are great bibs! 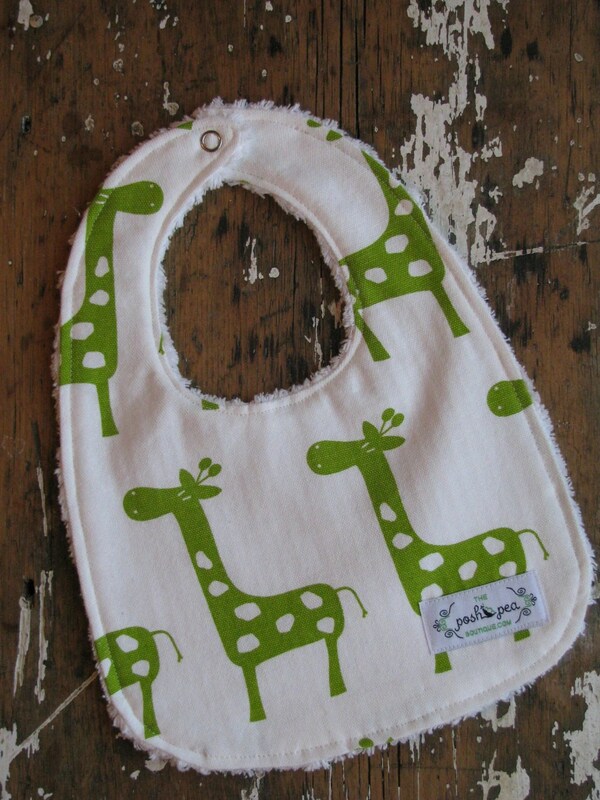 If I have another baby I’ll definitely be making some for the time when baby always wears a bib! I’m just chuckling that you have a giant box of misprinted D.A.R.E. t-shirts! Perhaps some bleach-reverse-tie-dye? Actually, I have my first 2 drying from my attempt at putting the fabric in a bleach bath this weekend. I love the shades of brown you get from bleaching black! Potty training is coming up and I know I’ll be using some for making Eli some underwear. I got my hands on a free pattern and figure I can makes some with multiple layers and maybe the addition of a layer of PUL for those first weeks (months?) diaper-free. Even still… there is A LOT of fabric! Thanks, Laura! I’m on my way now to check out your blog. This is such a great idea Karen. Mine aren’t babies anymore but will pass on to friends of mine. I have a linky party every Thursday called Thriving on Thursdays here in Australia. I’d love for you to link up this idea if you have a moment. What a brilliant idea! Such a great way to recycle old t-shirts! I am definitely doing this for Baby 2 and now I won’t feel guilty if the stains don’t come out! I like that there’s no velcro to attach it because I liked teaching my daughter to pull them over her head on her own. Holy Cow!! How did I miss this one?!? What a brilliant idea. I saw you featured at CRAFT. Awesome!! Great idea! I don’t like getting the cute bibs dirty either. Now I know what to do with all of my hubby’s ratty t-shirts! And I love the terry fringe on one of the fancier ones… Cute!